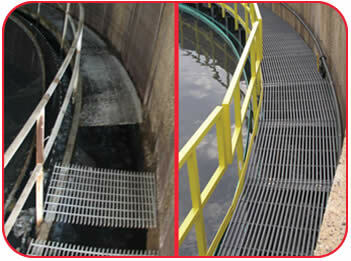 The primary clarifiers at the Albert Lea Wastewater Treatment plant in Albert Lea, Minnesota were in immediate need of an overhaul. The trapped gases inside the covered clarifiers had deteriorated the aluminum grating and rusted the steel framing to the point the walkway was no longer safe. The consulting engineers selected Strongwell’s fiberglass composite products as the best solution to this corrosion problem. The new walkway was built with Strongwell’s EXTREN® series 525 beams and tubes. A SAFRAIL™ fiberglass handrail system with 2-line side mounted posts and a 4 inch kick plate was assembled on location. Strongwell’s 1.5” DURADEK® I-6000 pultruded grating was selected to serve as the new walkway’s flooring. Rice Lake Construction, contractor for the project, found the fiberglass walkway to be much lighter and easier to install than steel. Rice Lake’s site supervisor, Brad Knight, added that Strongwell engineers were very helpful and he was very happy with the final outcome of the project.